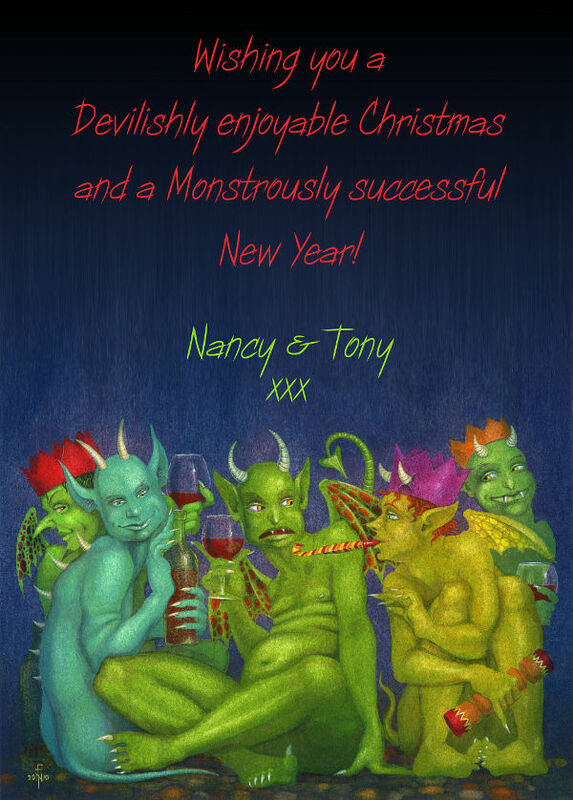 Belligerent demons, sullen fairies, twisted fairytales and other curious monsters - dark, whimsical, decadent contemporary art, all with a satirical edge and a twist of humour. Sorry, this website is no-longer being updated! I am a bit inbetween websites. This one contains a lot of artwork, especially the older pieces, but please visit nancyfarmer.gallery for new work and my blogs. If you would like to be kept up to date with the occasional email please email me and ask to be added to the emailing list. I have calendars for 1016! Next year's calendars feature sketches from my cat-of-the-day blog (it isn't daily and it's not just cats). For next year you have a choice of calendars: 'Swept Away' - a humourous selection of drawings inspirred by a year spent swimming outside, and 'The Year of the Cat' - sketches of cats and their doings.calendars page. I have calendars for 1015! Next Year's calendar is '12 Views of the Tor' (Glastonbury Tor, that is, for those of you who don't live round here!>. Until I run out, the calendars will be available and details can be found on my calendars page. In addition, limited numbers of the original etching and drypoint prints are available - to see each one go to the 2014 calendar gallery, or contact me for more information. A bit of catching up: I am in desperate need of a new website, but since I still haven't got round to it yet, I have just added some paintings that have never made it into my 'new work' page. After this month, the idea is that this website will more-or-less cease to be updated, and I will create a new one that is easier to run. However, I post a lot of work-in-progress, new pictures and so on on my art blog, so you will still be able to see what I am currently up to. I have just a handful of calendars left now and since it is now 2014 I've reduced them to £7.50 each. This is a series of etching prints and the calendar is the only way to get a digital print of these images - when they are gone, there are only the original etchings left, at £75 each. Go to the calendar page for more information, or email me. Hi, Merry Christmas and all the best for 2014... and thanks for visiting! .Funny, you wait all year for an exhibition and then three come along at once. On Saturday I took down the exhibition at Ilminster and in only a week or so I will be re-hanging everything back in Moorlinch ready for Somerset Arts Weeks... and then yesterday The Tollhouse Gallery, Clevedon Pier, contacted me: they've had a cancellation, would I be interested in wall space in their gallery for three weeks starting in the middle of next week. Well of course that would clash completely with Somerset Arts Weeks... so I said I'd be delighted and I would take the whole gallery! There are only a few days to go until the end of the deckchairs exhibition at Clevedon Pier, of which one of my 'Clevedon Mermaids' was one of the winning designs. The exhibition ends on 20th August (I believe some of the deckchairs will unfortunately have gone by the end of the day). If you missed knowing about this one, I'm sorry! It appeared on the blog, but if you would like to be kept up to date more personally, please email me and ask to be added to the emailing list (I don't send out loads of emails, so you wont' get swamped, just the occasional one). 'A Medusa for all Seasons' - the calendar for 2014 is finished! The calendar is finished and on sale at £12 per calendar, and if you have more than one, they are only £9.50 each. I have also discounted shipping so that shipping for a single calendar within the UK is free. Sorry if you'e not in the UK, though the design of this calendar, which folds up into a booklet, means it costs about half what last year's cost to ship, and the price of the actual calendar is the same as last year. The size, when opened out, is the same size as last year, but I really like the booklet design, it makes it a lovely object to hold. Inside are reproductions of my etchings, made especially for this calendar, and they will NOT be available as digital prints. So this is your chance to have a copy of each one without buying the actual etchings (of which I have a limited few for sale - coming soon). For photos and more info go to the calendar page, where you will find I'm actually so pleased with it, I even took a film clip of it, to give you an impression of the 'feel' of it! I have finished another of those gilded paintings that I like to do so much - a composition of masqueraders, gossiping, drinks in hand, all probably up to something. In this painting they are revealing a little more than usual though, being, as they are, entirely naked except for the masks. Photos of the finished painting are up on the blog now, and if you search the blog for 'naked masquerade' you will find a few more pictures of the work in progress. I have been having a spot of bother with a shameless (and thankfully talentless) plagiarist, who goes by the name of Wendy Marani, or sometimes Wendy Marani Hall. I came across this woman's 'Medusa Series' in an online gallery which has since removed them, but Marani herself refuses to respond to me, and still has her copies of my paintings, and those of at least two other artists, displayed in other places on the internet. There being no easy legal recourse, I have been doing my best to get her name spread far and wide around the internet, and at the same time entertaining the readers on my blog with this 'cautionary tale' (still ongoing at time of writing this). To this end, I have made a summary page of the story, where you can find links to all of the satirical blog posts about her, and other information. Her husband, Don Hall, claims to be a well known artist, so even if she is unwilling to take down the images, perhaps he might seek to persuade her. Do visit and feel free to link to this page with the name of Wendy Marani, if you would like to assist me in this effort! The page is here: http://nancyfarmer.wordpress.com/wendy-marani-plagiarist/. The series of Medusa Pictures for the 2014 calendar is nearly finished! ...yes, I know this seems a little early, but it will be a calendar of etchings and I do not get the chance to do etching through the summer. Visit the blog to see them, as this website is a little behind at present. I shall get it up to date sometime soon. Hi, Merry Christmas and all the best for 2013... and thanks for visiting! The 2013 calendars are selling fast! 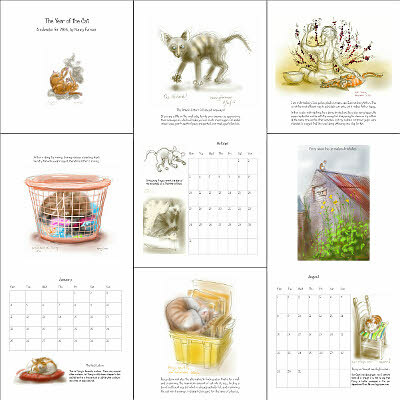 I have been posting out orders of my new 2012 calendar for a couple of weeks, and in fact I ran out of my first batch and have had to re-order. It is unlikely there will be time for a third batch before the end of the year, so order now before I sell out again! For more information visit the calendar page. I've been rather too busy lately to add new work to this website (they will appear in due course when I have time), in the meantime you can see my most recent efforts on my blog. These include the beginning of a series of Medusa etchings for the 2014 calendar. The 2013 one is of course already for sale - see below - but it was rather time-consuming this year and so I have started well ahead for the next one! Click here to see the current progress. I am now taking orders for the 2013 calendar! I have not, in fact, quite finished painting the pictures for it, and it is not printed yet, but I have been hard at work on a new set of paintings just for the calendar! I am now taking orders, to be shipped out when it is ready, probably sometime in November, but I will keep you informed. As usual this will be a short print run, so order now to avoid disappointment! THis year's calendar is an all-fairy calendar and will include at least 11 brand new paintings. Go to this page to see a preview, prices, and to place an order. I have just updated this site and added no fewer than 11 new works to it. They include 4 commissions, which you can see in the Commissions gallery, an etching, last year's Christmas Card picture, and another Masquerade scene, this one with a great deal of gold leaf as foil for a rather unusual almost monochromatic painting. I have also added four Poison Flower Fairies - a new series I thought would be entertaining to go with The Flower Fairies Go to Seed. That brings my unusual Flower Fairy paintings to a total of 7, so I have also created a special Alternative Flower Fairies gallery. I believe this may now bring me right up to date, except for the calendar paintings, which I am in the process of finishing. As ever you can see everything I have recently added by visiting the new work page, and I now also post updates on a blog at http://nancyfarmer.wordpress.com/, where you can frequently read about my very recent (indeed often unfinished) paintings, and see step-by-step photographs of many of them as they develop. The third in my series of Poison Flower Fairies is now on the blog - this is the rather dramatic-looking "Ricinus Communis, fairy of the Castor Bean Plant". And now I am taking a ittle break from poison flower fairies with a new masquerade piece, currently entitled "Vis-à-vis", the sketch for which you can also see on the blog, here. At present, though, I am mostly mounting up life-drawings, wrapping prints, and creating a few more coasters in time for our next Spring Farm Arts open weekend next weekend - for details of that please visit the Spring Farm Arts website. ...11 new images in all! The website is now up to date again where it comes to prints, though there are one or two paintings that I shall be adding when I get the chance. The first thumbnail to the left here is one of my mezzotints - a completely new technique for me - click the thumbnail to see the group of five of these prints, and to read an explanation of what it's all about. Next there is a second group of five new pictures - this time a set of etchings, all inspired by proverbs about gold, and all incorporating a little gold leaf. The last thumbnail to the left is one more etching - a larger, lighthearted piece about 'Wine, Women and Cats. Click on the thumbnail to see it, or visit my new work page. I'm delighted to report that my drawing 'Fornicating Fairies' has won the Grand Prize at the Art Erotica exhibition in Cork Street, London (19th - 27th January 2012) - follow the link to find out more. My newly-begun blog is now showing my first mezzotint prints. Visit http://nancyfarmer.wordpress.com/2011/12/23/a-first-attempt-at-mezzotint-part-3/ to see the first results of my experiences with this facinating and rare engraving technique. There is nowhere on this site for me to post pictures of what I'm currently up to, as opposed to finished pictures, so I have started a blog. This has the other advantage of coming equipped with an RSS feed, should you wish to keep an eye on it you can chose to be informed when I post something new. Click here to see my first post, and my first attempt at mezzotint. My (terribly rude) Fornicating fairies drawings have been shortlisted for the Art Erotica to be held in Cork Street galery, London, in January. To see more details please go to my Exhibitions Page. Special Sale: The last of the Gold Fairies, for only £55 each! Recently I picked up a few of the gold fairies that had been on display and away from home. I now have the very last few all gathered together at home, and, being all shiny gold things as they are, it seemed a rather nice thing to offer this last few at a very festive discount. So, they are only £55 each, just until the end of December. Price includes frame, but not shipping. They are in pencil and 24 carat gold leaf and all completely individual. Please email me for details if you'd like to snap up one of these original drawings. To see them all, please visit the gold fairies page. I have been making some rather nice little gift tags, illustrated with details from my paintings. You can buy them here. What with gift tags, baubles and christmas fairs, finished artwork has been rather thin on the ground lately, however, you can keep up with one or two works in progress by looking in on my facebook page. This year has been short on paintings, but some of that is because those few I have completed have been complex, detailed, and for the most part involved rather a lot of gold leaf. This painting is no exception. Continuing with the theme of masquerade, and an over-enthusiasm for backgrounds gleaming and golden, here is 'A Murder of Crows'. Inspired by favourite collective noun. Click on the thumbnail to see it, or visit my new work page. New and bigger Calendars! I have ordered some lovely, big, A3 size calendars for 2012, featuring my etching prints, and I have ordered only 80, since I've never done them this way before and I can't afford to be left with any in January, so order now to avoid dissapointment! Go to this page to see more. New Work: A lot more paintings and etchings. I have been tidying up loose ends and trying to get everything on the database, before I am overtaken by several exhibitions one after another and I get even more behind - see above and my exhibitions page for more details of these. Now for once, I believe the website is almost completely up to date! I have just added several more items, some of which took a month or so each, so that only goes to show how far behind I was. There is a new addition to the series 'The Flower Fairies run to Seed' - making a grand total of 3 - which still isn't much of a series, but I'm getting there! Then there are another 3 paintings, each more complex than the last, seemingly, and each of which used rather a lot of gold leaf. Finally, I have added the last couple of etchings to the Etchings gallery. The only outstanding items now are quite a lot of coasters that must at some point be added to the Small Stuff gallery - if I don't sell them before I get round to it, which seems to happen a bit with coasters... Now I have just to re-label everything and re-arrange them on the walls, three times in the next two months! Click the thumbnails to the left to see the new additions to the site, or visit the New Work gallery. Oh, and one more thing - if anyone would like me to email them with news of when I have exhibitions, please send me an email and ask to be added to the emiling list - I don't email out very often, but it saves you missing something and having to check the website. So, I am continuing with the much-needed catching up! I have now added several new etchings, some of which have been waiting some time to be added to this site. In addition I have added a few need Stain Devil Coasters, though, as usual there aren't really very many of these available, as often they tend to get sold before I can update the site... and I have also added a lot of new life drawings. It has now become apparent that there are far too many life drawings on this site and they are swamping the shop pages, so very soon it will be time to re-arrange the shop and perhaps put the Life Drawings into a category of their own, and quite probably weed out many of the weaker drawings as well. For the moment you can see them all in the Life Drawing section of the gallery, but expect it to shrink in the near future! New paintings: The Flower Fairies run to Seed! I can finally update my website properly again! I have been unable to do this easily for technical reasons for some time, plus, before Christmas I was just so very busy that a lot of new stuff didn't get put on the site, so I have a backlog, mostly of etching prints actually; however, to start with here are a couple of paintings that I finished in late August of last year. Back then I'd painted a couple of rather generously proportioned fairies with undersized wings, who were suspended on balloons for extra lift... continuing the theme of large girls, I suddenly had the idea it would be a rather nice plan to do a few 'mature' flower fairies - not the thin skinny little ones you expect, but big curvy ones at the 'fruit' stage of a flower or plant's life. And I picked the ones growing in my garden as that seemed like a rather nice idea. Unfortunately there are so far only two paintings: pumpkin and rose. I started one about runner beans that I shall one day finish, and maybe later there shall be more. I apologise for not having updated this site recently - I have several pictures waiting to go up now, but there have been technical issues with the site, that I'm still working through, and I simply haven't had the time to get on and fix it all at once. I am nearly there! Very soon I will get back to updating this site as usual. In the mean time you can see some progress and new stuff on my Facebook page, click here or on the thumbnail to go there. Colouring-in drawings: download for free and colour in yourself! I have posted a small collection of colouring-in drawings for your amusement... or more properly for the amusement of your children, if you have any. These were originally done for my nieces and nephews, and are all suitable and safe for children! Clicking on the thumbnails will take you to the shiny-new colouring-in gallery, once there, clicking on each image will bring it up in its own page where you'll find the images are big enough to save and print out at about A4 size... easy... or at least I hope so - any problems email me and I'll try to help. Hi, Merry Christmas and all the best for 2011... and thanks for visiting! I have been doing a bit of catching-up here on this site, and have just added a lot of little stuff: I have reached number 100 of the Stain Devil coaster series and all the unsold ones are now up on the site. This isn't actually very many - they've been popular - so if you were thinking of buying any for a last-minute Christmas present, you may want to hurry! I've also added quite a lot of new life drawings - some framed, some unframed. All unsold ones are currently available just from me, but that may change in due course. I also have a couple of paintings and etchings waiting to be added, so check back soon to see more new stuff! I have prints for sale again in Glastonbury! Those of you who know both Glastonbury and my pictures may have noticed that GalleryEight, sadly, has gone, and for a while I didn't have anywhere selling my prints. Well, they're back, now available from Glastonbury Galleries. I have dropped off a good selection of pints, plus a few etchings. These four pictures are all etchings done this year - some quite early in the year I have to admit, so it's high time they made it onto the website. Nonetheless the timing seems somewhat appropriate: the garden outside again has the elegant decay of autumn, just a little threatening, colder and darker than it was, and somehow these monochrome pictures seem fitted to the season. The first two to the left are definitely sinister: here is the second re-appearance of 'The Guilty Party' - this time re-worked as a more compact, simplified image, more suitable for etching. 'The Crimson Masquerade' also has a painted version, called 'Better the Last Smile than the First Laughter' - follow the link to the left and you can see both versions. And on a lighter note, there are fairies and angels, as ever! Click each picture to see them or, visit my new work page. I apologise, I haven't posted a single piece of news here in the month of August... instead I've been hard at work trying to get a few new paintings done for exhibitions. It does seem to be about time I added some pictures, though. These particular ones were mostly done in June and July - for the august paintings you'll have to wait a little while, though you can also take a peek on my facebook page. Anyway, you can click each picture to see the results or, as usual, visit my new work page. 'Tea on the Lawn' is reminiscent of most English summers, though not, I have to admit, this one. Which is just typical, of course: just when you thought you could rely on the weather to rain all summer, it doesn't! Anyway, it was painted for an exhibition at the 303 Gallery entitled 'Whatever the Weather', and seems appropriate for all that. 'Better the Last Laugh than the First Laughter' is another masquerade scene, and, like the last one I have gilded the entire background of this painting, this time in 24 carat gold, with inset bits of green gold leaf... and since I had the green gold still as transfer leaf and not loose leaf I have one or two scraps left now to make a couple more gold Demons in a Coaster, which I have almost completely sold out of now. Click the thumbnails to see these new paintings on this site or, as usual, visit my new work page to see all the new things. ...visit the New Work page (menu bar top left). My art is largely concerned with the re-working of themes of fairytale and fantasy, mixed with many modern-day references, often trying to give a little dark disturbing twist to my interpretations. The result is something that hovers somewhere between fantasy and satire, and is not quite either. My characters resonate with modern-day decadences - the fairies are delinquent; the devils bored, half-heartedly persecuting the damned merely because it is their job to do so; the Guardian Angel is fat and indolent, her rose-tinted spectacles shielding any wrong-doing from her 'watchful' eyes. I intend, however, not to depress you, rather to amuse, sometimes disturb, and just occasionally I may hope to make you think. Have a look at the info section to read a little more about how my paintings are created. Welcome to my view of the world.